Hey Stashbusters! Today we are talking about knit fabrics! Inspired by Melissa at Mahlica Designs and her fantastic Versus series, I thought I would write up my own version of this. I wanted to compare how the exact same pattern would sew up in two different knits. Cotton Spandex Knit and Cotton Rayon Spandex Knit to be exact. Let’s start with a little background on the pattern first. The pattern I picked is M6559 in view D. This is a pretty basic pattern as it only has two pieces. It is a quick make, which is good for me. These are the 3rd and 4th versions I have made using this pattern. 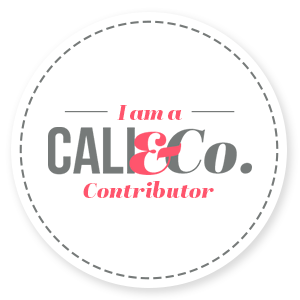 Surprisingly, this is the first time I am really blogging about this pattern. I kind of reviewed it here but not very much. For both versions I made a size 22 with no fitting alterations. For both versions I did add a contrasting trim to the neckline and armholes and a simple rolled hem finish. I love the contrasting trim I added as a different way to finish my openings. I haven’t posted it yet, but I do have a pattern hack tutorial written for a different pattern that includes how to add this trim, so I am not going to post it here. I really do love this pattern for its simplicity. 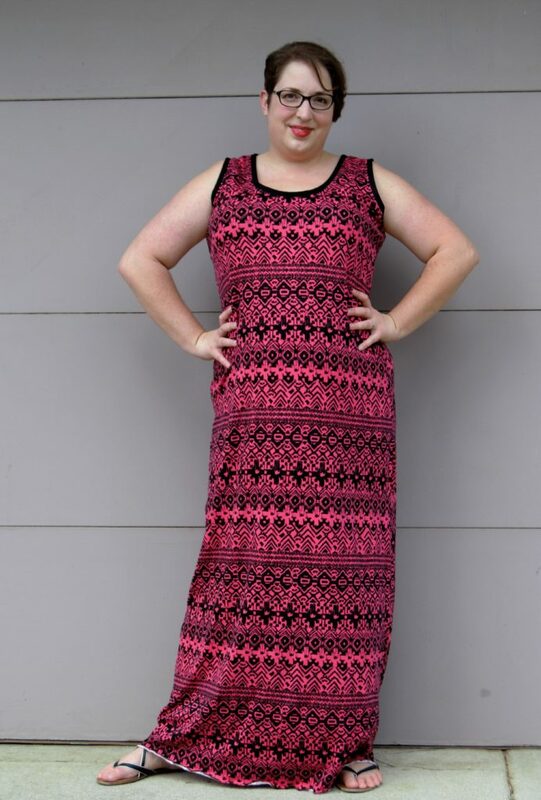 It makes a great summer dress for me that I am going to make over and over again. Let’s get down to the main event though. I compared each fabric in the following areas: sewing experience, all day wearability, first laundry cycle. 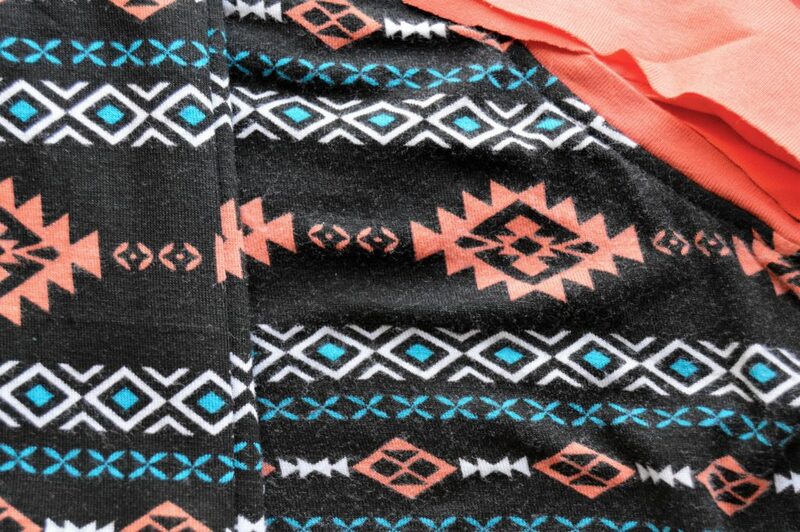 First up is a Kumquat Teal Navajo Modal Cotton Rayon Spandex Knit Fabric from Girl Charlee. I used 1.75 yards of this fabric that I purchased back in 2014 during their Black Friday sale. The total cost of this one is $4.38. 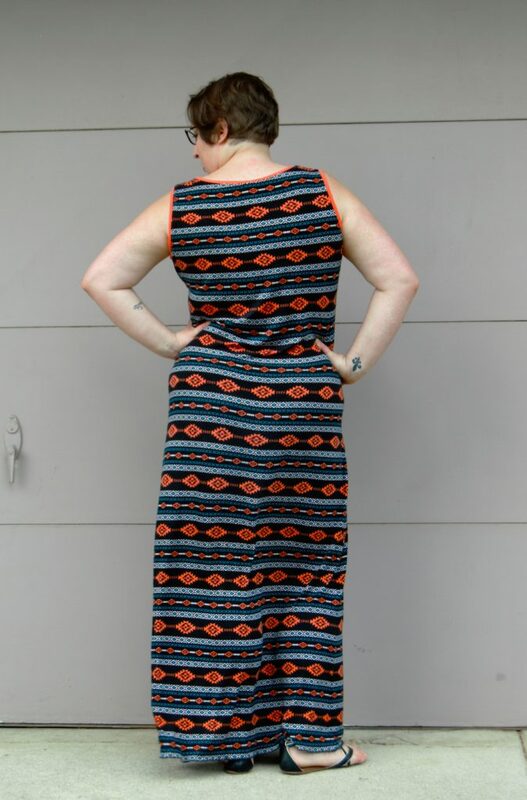 I also used scraps of an Orange Rayon Spandex. It wasn’t enough to count for anything though. This is a very soft drapey knit, that clings in all the right places. It is typically used for sleep wear, making this kinda like secret pajamas. 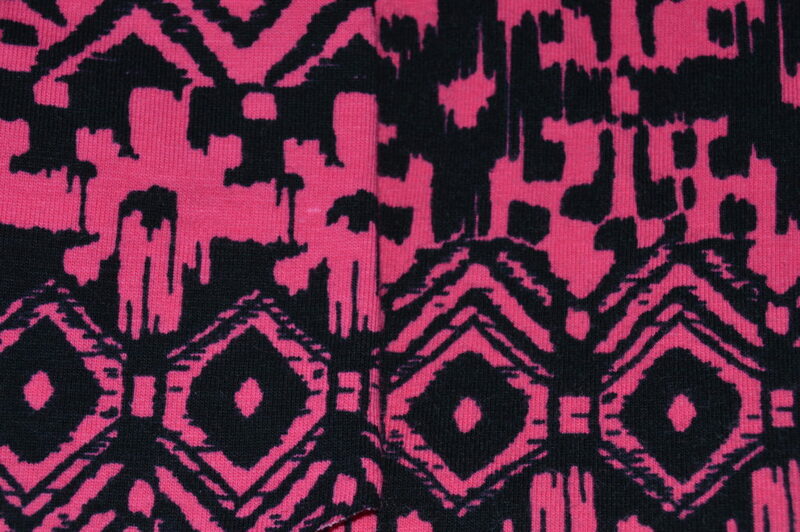 The second fabric is Pink and Black Ethnic Cotton Spandex Knit. This one also came from Girl Charlee and was in the August 2015 Knitfix I purchased last year. I used 2 yards which was a cost of $11.50. For the contrast I used some scraps of Black Ponte De Roma that I had laying around. For this version I added 3″ to the bottom hem since I did not pre-wash the fabric because I wanted to do a laundry test. This fabric is a little thicker than the other, but it feels more like a comfy t-shirt. The Rayon Spandex print can go either direction, so I had no problems being able to match up the print at the side seams. It is darn near perfect! Rayon Spandex does present it’s own set of sewing challenges though. This fabric has a lot of stretch to it, so it was very important that I not stretch the fabric as I was sewing. Having a pattern to match at the side seams helped immensely with that. For all knits I make sure I use bulky nylon as my bobbin thread on my straight stitch machine and looper threads on serger. I also make sure I use a jersey needle. The cotton spandex, unfortunately, is a one way print. With only having two yards the front and back panels go different directions, so there was no way I was able to match prints at the side seam. This one has a good amount of stretch to it, but not as much as the rayon spandex, making it a bit easier to sew with. It would be a great knit to sew if you are new to knits. The only downside to sewing this fabric was hemming. The cotton spandex tends to curl up and my rolled hem is not visible now and I have a narrow band of the underside of the fabric showing. I love wearing this rayon spandex dress. I said earlier that it is like secret pajamas, making it a super comfortable fabric to wear. 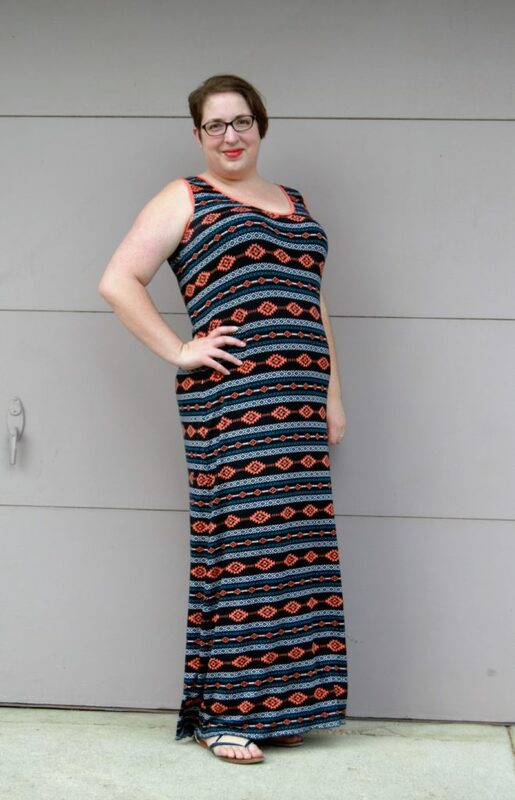 The stretch and drape in this fabric makes it flattering in that it shows off my curves! The fabric does tend to stretch out during the course of the day, but after letting it sit over night it recovered pretty darn well. Since the cotton spandex doesn’t have the drape as the rayon spandex, it does show off my curves as well. It is a little baggier looking in the waist creating more of a column look from the chest down. On the plus side, this one does stretch out a bit while wearing, but does not recover as well as the rayon spandex did. Since I didn’t wash it before wearing, the extra inches I added were slightly problematic. Good thing that isn’t going to be permanent. Part of the reason I wanted to wait to wash them until after wearing them was I knew how the rayon spandex would turn out and it performed as expected. This is the biggest let down of rayon spandex for me. In the picture the fabric on the left is unwashed and the one on the right is the finished garment. You can see that the finished garment has white fuzzies all over it, causing it to have a faded look. This is because of the rayon fibers. I hate that this dress now looks super worn after only one wash. The cotton spandex, by contrast, washed up wonderfully! If you can see the dividing line down the center, the one on the left is the unwashed fabric and the one on the right is the washed garment. They are identical in look! No fading at all! The fabric did become a bit softer though, which is a plus. It did shrink up a bit in the hem, but not as much as I added to the hem, so I will re-hem this one. The cotton spandex knit! 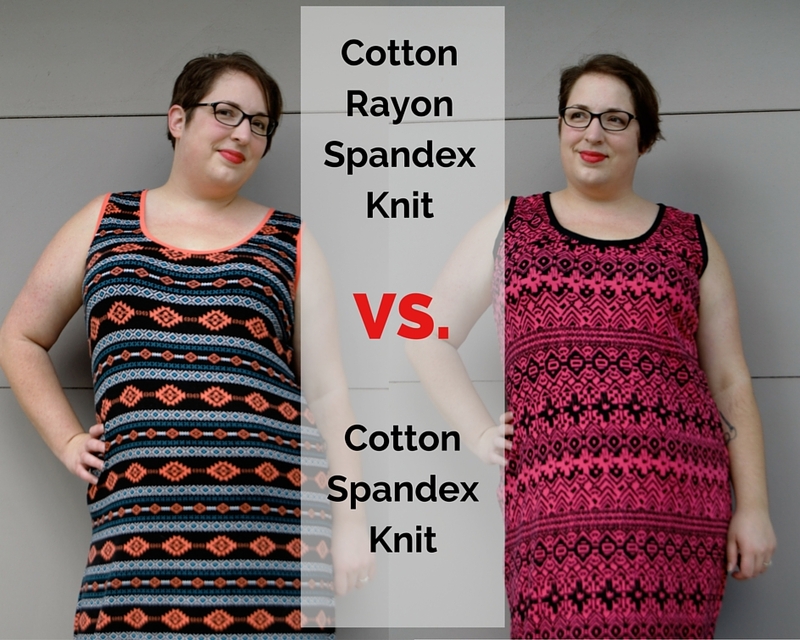 I think the washability of the fabric was the deal breaker for the cotton rayon spandex knit. I want my garments to be of great quality and how they wash and wear is a huge part of that. The downsides of this cotton spandex can be looked passed because this fabric still looks great after washing and I expect it will hold up for quite a some time. I do have another cotton rayon spandex knit that is mostly white and navy that I am curious to sew up and see if it washes the same as this mostly black version. Have you sewn up either of these fabrics before? What are your thoughts on them? 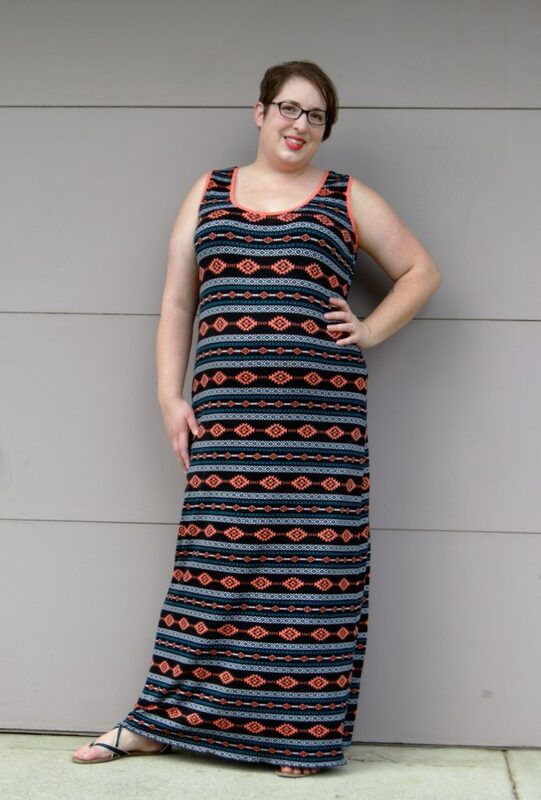 This entry was posted in Sewing and tagged cotton rayon spandex knit, cotton spandex knit, fabric showdown, M6559, maxi dress, McCall's, Stashbusting, versus. Bookmark the permalink. I love a rayon spandex for its drape but I’m always disappointed by the fading too, I’ve not found a happy medium between the two fabrics. I tend to lean toward the cotton spandex because it does seem to hold up better. Love how you compared the two fabrics side by side like this! It’s amazing the difference that the knit content can make. I’m currently sewing up the same pattern from two knits, and even the fit is turning out different. Also, I’m hoping/planning to cut out that exact dress pattern today. It’s a good one. Marcy Tilton, on her website, advises not to put the rayon knits in the dryer. It is the dryer where all the fibers break, causing that halo effect that makes the fabric look worn. If you line dry/lay flat to dry your rayon knits will hold up much better. Thanks for this breakdown and details. I’m new to knits (I’m a knitter, but have yet to sew with knits! LOL!) This was very helpful.